Home exercise equipment to strengthen and tone your muscles in minutes a day! Strengthen your core, thighs, glutes and quads with this unique home exercise equipment! Do you want to get in shape but find it difficult getting to the gym or you simply don’t have time? 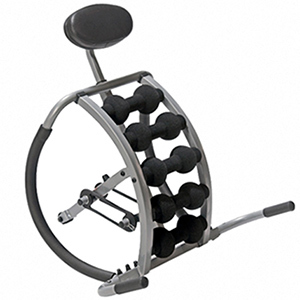 The Lanaform Back Gym is the ideal solution to getting in shape fast. Neat and compact and especially easy to use, the Back Gym from Lanaform is your ideal solution for sculpting your upper and lower body, toning up the muscles you want to focus on. At StressNoMore we want you to Move More and we are always on the hunt for the best home exercise equipment that you can use easily in the comfort of your own home. No gimmicks, no fuss – just neat, practical ways for you to ‘Move More’! If you suffer back-ache you need to strengthen it and this is the safe and easy way to do it, also maybe mention that is it ‘pelvic floor safe’ because it works the core without putting pressure on the pelvic floor which is vital for women with a weak pelvic flor, prolapse or following hysterectomy. Partake in body sculpting exercises similar to those undertaken in gyms and fitness establishment. The beauty of the Back Gym lies in the fact it isn’t just for one singular body part. Using the back gym for regular, short daily sessions it will allow you to build up and tone the areas you feel need work. If you really want to ehance your results then using the back gym alongside a healthy balanced diet and lifestyle will provide you with maximum results. What are the benefits of using the Back Gym? Exercising can give you back control in your life and feel better about yourself. Exercise releases endorphins and gives you that ‘feel good’ factor so incorporating regular usage of your new back gym, not only will it give you results but a mood boost too. There are a number of advantages to using the back gym, some of which include. Take back control of your exercise regime, just because you can’t make it to the gym doesn’t mean you can’t have a great work out and look better than ever!